As predicted, it's been a busy weekend! Of course, I waited until the last minute to create my card and then on top of it all I had to deal with a little technical difficulty from the new router! I don't know where it gets off telling me blogspot.com is a malicious website! Hmph! After a panicked call to my brother, a setting change, and a computer restart, I was back up and running so that I could tell you about the new Corrosive Challenge that starts today! We are sponsored this fortnight by the devilish and delightful Delicious Doodles! Teri has offered 4 digis of choice to our winner (plus the team was generously given images to work with)! Our theme is "Show Us Your Metal"! C'mon! Show us what you've got! Hardware, that is. We want to see you embellish your projects with at least one item made from metal. 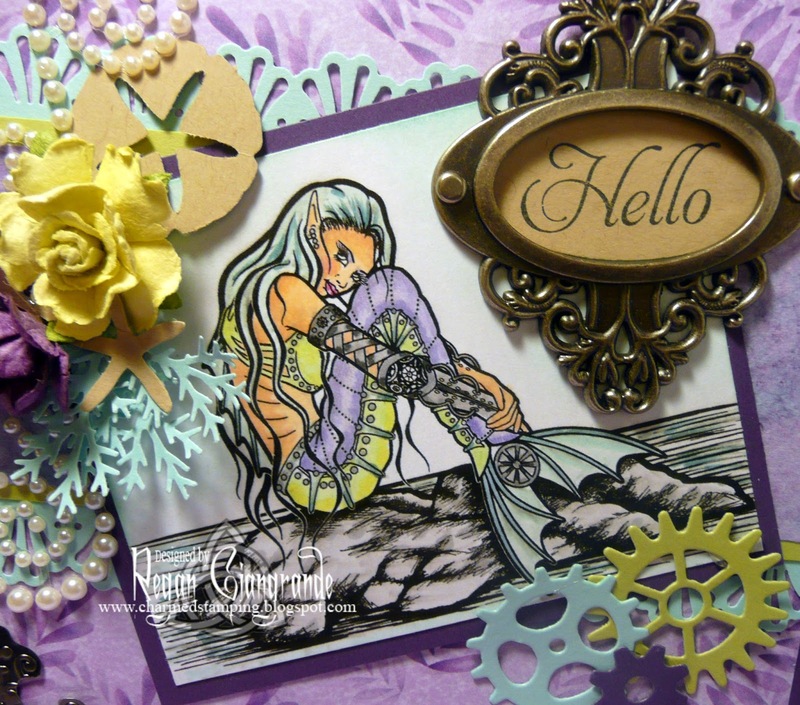 I opted to work with Steampunk Mermaid. She is colored with Copics and sponged with Pool Party classic ink from Stampin' Up. My metal pieces are from Tim Holtz because we all know I totally have a crafty crush! I've used an Ornate Plate and a metal corner. I also added flowers, pearl flourishes, and die cut gears made using the My Favorite Things Time Pieces Die-namics. Several punches were used as well (Martha Stewart and Stampin' Up). The sentiment is from a Stampin' Up set called Elementary Elegance. And the patterned papers from my stash are Paper Pizzazz. The sketch is the current Deconstructed Sketch (#144) but I set my image panel at an angle. Be sure to pop over to The Corrosive Challenge blog to see what fabulous creations my teamies have forged! Thanks for visiting! Markers used: Copics (E00, E11, E21, R32, R81, RV66, N0, N2, N4, N6, YG00, YG11, BG10, BG72, BV000, BV02, BV11, BV13). Great interpretation of the sketch. Love the colors and your coloring. Awesome as usual! Regan, this is so beautiful. Love how your colored it, beautiful coloring and paper. Love it! I love what you have done with this sketch! I've actually made a card with it myself. your colors are simply lovely. what a beautiful card! Love this image! Love your metal frame! Very pretty card hun. 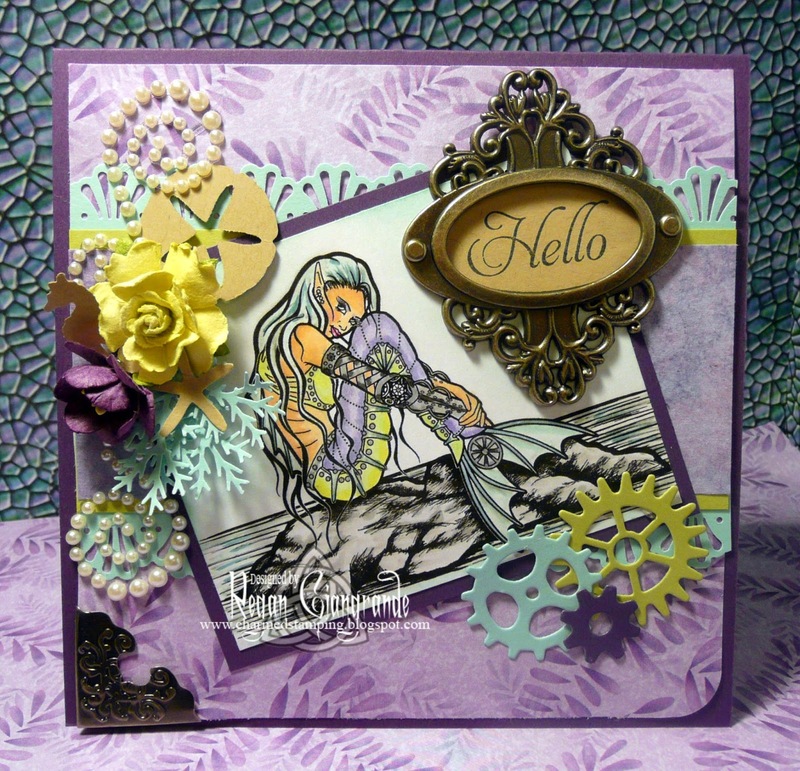 I love the subtle colouring of the mermaid...very nice. Thanks so much for joining us at Digitally Sweet Challenges! Thank You for joining us at PIO this week! Lovely card! Thank you for joining us at Digitally Sweet! Hope you will join us again! LURVE that image, an all together fabulous card. This is really a great colour - combo! 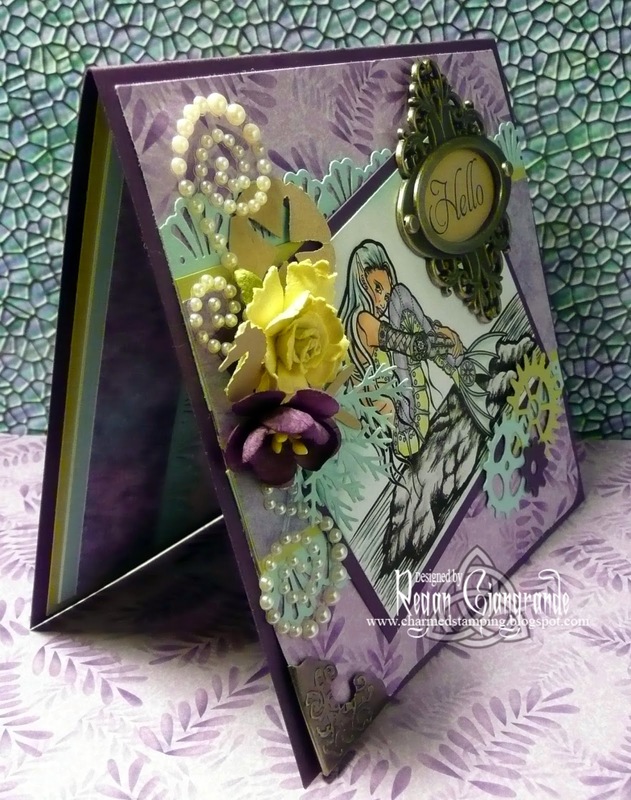 I love how you used your embellishments on this beautiful, dreamy card!